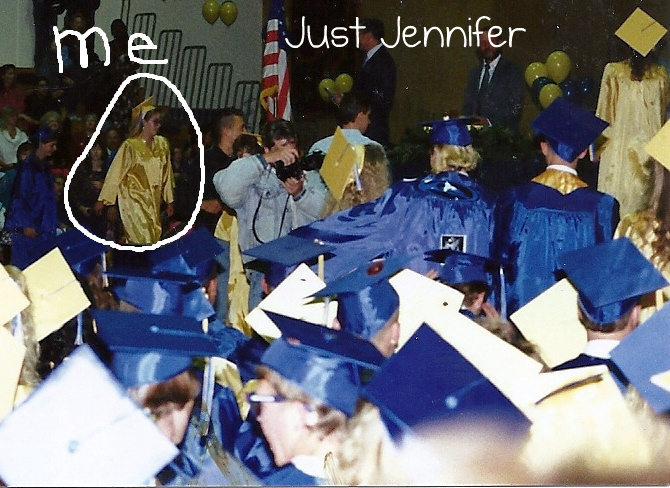 Twe-cough-nty years ago THIS YEAR I graduated high school. 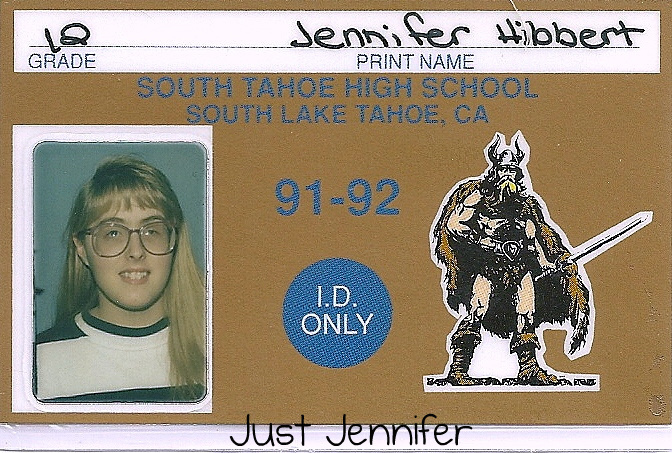 South Tahoe High: Home of the Vikings. I had an interesting last couple years of high school. I really didn't have much fun my senior year, barely managing to squeak in the final memories of the senior class picnic and prom. I'm feeling a little self-conscious about sharing these photos because they show my blind left eye, long before I got a pretty prosthetic. BONUS: My BFF's prom pic - she was really HOT! which has nothing to do with this photo! Man, there's no denying that I've changed a lot! Oh man... I'm not sure I would have the guts to post my senior photos! According to my hubby, if he knew me then, he would have tucked tail and run the other way! You are totally right about Jen! OMG, work it girl! Eh, it's the past. What'r'ya gonna do? Mother, get rid of that shirt! I don't think you have anything to feel self conscious about. The photos look amazing! Anyway, I'm having tattoo envy. Right now. In 2012. So there's that. I got that tattoo only 2 years ago, when I was 36. I'm dying to get my second one! Girl, your bangs were awesome. I could never get mine to do that! I'm so impressed with the consistency of your hair :) And I love your today picture, too! Wait! I'm now remembering flashbacks to having an ankle bracelet just like that! Was yours beneath your pantyhose? I think I did that with mine, too! Ha! Thanks a ton for playing along!! Never be self conscious! That's part of who you are! 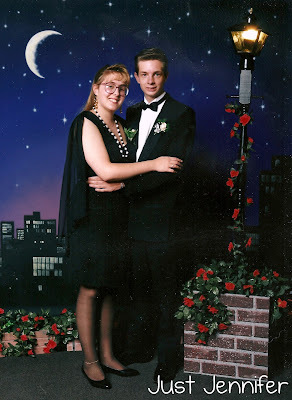 I love that cheesy lamp post and moon in the prom picture. So classic. It was an "Evening of Moonlight and Roses"! Wow. 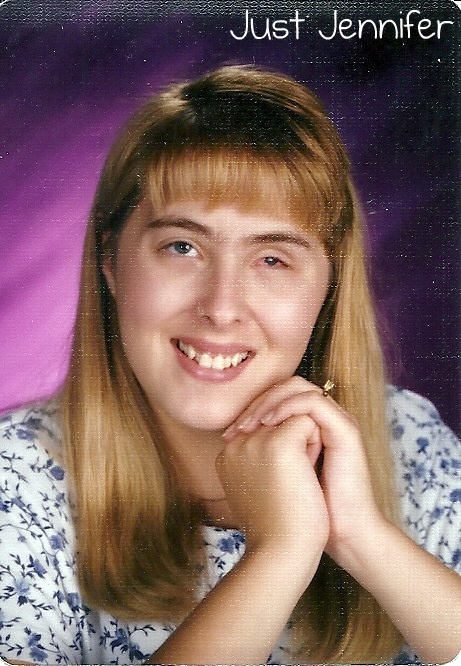 I bet getting that prosthetic eye was a big event for you. So amazing what they can do. You are beautiful then and now. Love the tat! Love all those pics. Don't feel bad, I graduated, thir-choke-ty years a go. I knew there was a reason I like you (cuz you're older than me)! Awww, you look great! I am just behind you as I graduated in 1994 . . . which feels like forever ago but not so much . . . if that makes any sense. Haha! I'm scared to dig out my pictures. Crimping ran rampant in my hair along with stirrup leggings. Oy. Oh I think we had that starry backdrop for our prom too! 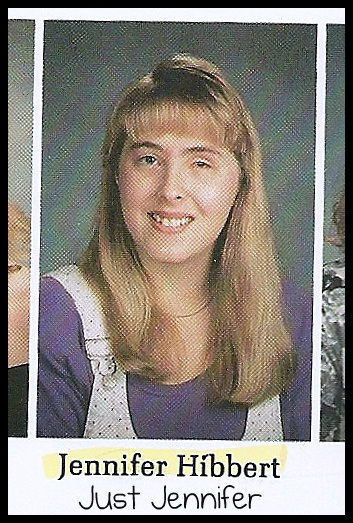 I am totally jealous of your bangs. Mine were a sad imitation of yours. I could never get then to lay straight and I looked like my head was crooked! It was not a good look! Aw, you have bang angst! Love your photos! 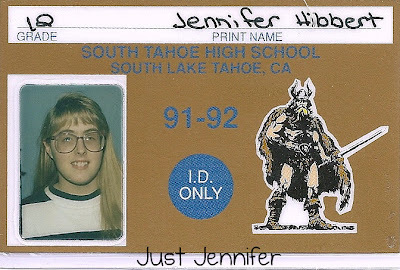 I wish I would have held onto my senior year ID card. I have so many pictures of myself where my bangs look just like yours!! Quite a bit, I'm sure!